April 11 – With almost inevitable haste, former German Football Association president Reinhard Grindel, forced to resign after being embroiled in a domestic scandal, has also quit his high-ranking FIFAand UEFA roles leaving a gaping vacuum at the heart of both administrations. Grindel has thrown in the towel as both a UEFA vice president and as a member of the FIFA Council, just a week after revelations about undeclared earnings of €78,000 and the receipt of a luxury watch 18 months ago from former Ukrainian FA boss Grigoriy Surkis. He confirmed his decision in a letter to UEFA president Aleksander Ceferin, throwing European football’s power base into turmoil just when it needs its strongest voices to keep banging the drum in scrutinising the leadership of FIFA under Gianni Infantino. Reports suggest Grindel, who headed the world’s largest single footballing federation, could be replaced on UEFA’s executive committee on an interim basis when the body next meets on May 29 in Azerbaijan. Nonetheless he has been under increasing pressure to give up his posts at both international federations and the move means that once again, Germany has no place at top table of either organisation. Grindel was a powerful force earlier this year in helping his country trounce their only opponent, Turkey, in the race to host the 2024 Euros. The Turks must now be ruing the fact that they lost out to a country whose top administrator has been humiliatingly forced out of office. 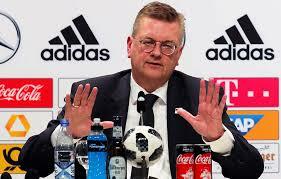 Ironically, when Grindel took over at the DFB in 2016, he promised to restore credibility after both his predecessors, Theo Zwanziger and Wolfgang Niersbach, had also been forced out over the still festering 2006 World Cup bid scandal. Equally ironically, in recent months Grindel had become increasingly outspoken over the way he claimed FIFA was being run under Infantino in terms of decisions being made in secret and without proper consultation, in particular Infantino’s blueprint for expanding the Club World Cup. Reports suggested that by stepping down, he avoided his case being sent to FIFA’s ethics committee for investigation. But in the process UEFA have lost a powerful voice on the FIFA Council at a crucial time, with the FIFA Congress to come in June when Infantino will be re-elected unopposed and a FIFA Council ruling is due on his contentious project to change the face of global competitions.